Palanga beach lies in one of the most popular Baltic Sea resorts. 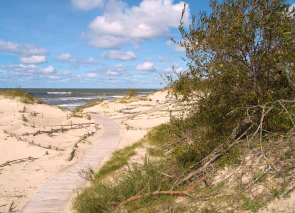 It has a stretch of about 10km of sandy beaches backed up by small dune coves and pine trees. The sand on the beach is fine, soft and silky and is perfect for sunbathing or serene walks. The beach is very much enjoyed by adults and children alike. Basanavicius Street, busy with restaurants and cafes, leads you all the way up to the central beach. 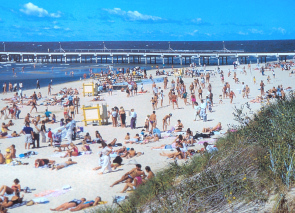 In high season, the area at Palanga Sea Bridge is always full of people. There are several beach cafes there and a beach valley-ball court erected in front of the music club "Anapilis". Further away from the bridge you will come to more peaceful and more secluded beaches, which are my favourites. You feel more in harmony with the nature with few disturbances. The water in the Baltic Sea is clean and temperature of the water is comfortable to swim in. Among other beach activities you can use water bicycles or water motorbikes in certain places in the open sea. There has been a long tradition to come to Palanga bridge to watch the sun setting into the sea. John and I loved to come here late at night and stroll to the very end of the pier listening to the sound of the waves breaking up under your feet.